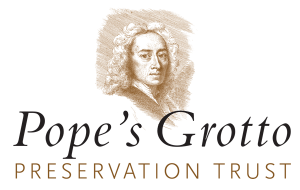 By subscribing to our email list you agree to allow us to contact you by email to keep you informed of our project’s progress, our events and other information relating to Alexander Pope and his grotto. We will retain only your email address and name (if supplied) on a secure server. You can remove your information either by following the ‘unsubscribe’ link on any of our emails or notifying us through the contact form on this website. We will remove your subscription within five working days. Pope’s Grotto Preservation Trust will not pass information you provide to any third party unless required to by law.